With Boss Revolution you are never on your own. We offer free training on all aspects of how to sell and how to use Boss Revolution in your store. We like to make things easy and that starts with signing up to sell Boss Revolution in your store. Ready to get started? It only takes 10 minutes! Selling Boss Revolution is easy. Anyone not already a Boss Revolution customer gets $1 in free calls. Paid for by Boss Revolution. No purchase required. Since I started working with Boss Revolution 5 years ago I've seen other companies come and go. 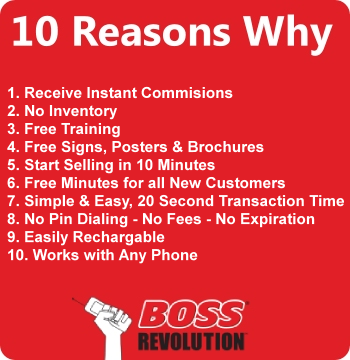 Boss Revolution pays commissions on time every month, offers great quality products and always investing in their band so customers recognize their products. I know Boss Revolution is here for the long run. Commissions are good and I get paid instantly. Selling Boss Revolution couldn't be any easier. I decided to offer Boss Revolution in my store because my customers kept asking for it and when I told them I didn't carry it, they started going to my competition. Now I can tell them yes! My customers are happier and so am I. There are a lot of different reasons why you should be selling Boss Revolution in your store, to learn just a few of them click on the toggles below to learn more. Easy to Sell. Start Selling in 10 Minutes. With all of the calling cards available today, Boss Revolution has hit the market with a better product that’s easier to use for the end user, your customers! That alone makes Boss Revolution a breeze to sell. Even better than that though is the strong brand recognition that comes with Boss Revolution, you’re customers might be looking for elsewhere for it. Due to the strong brand recognition of Boss Revolution you are in a good position to bring in more customers just because you sell it in your store. What are you waiting for? Get your free sales kit today! BOSS Revolution brings both value and convenience with high-quality products and services, which drive consumer traffic, revenue and loyalty to your locations providing increased revenue opportunities. No Inventory. No Overhead. Takes Up No Shelf Space. When you sell Boss Revolution in your store we’ll ensure that you have all of the material you need to sell it! From posters and brochures to point-of-sale signs, we have what you need. All at no cost to you! Along with our pinless international calling product you also have the ability to sell Mobile Top Up. What is Mobile Top Up? With Boss Revolution you can recharge friends and families mobile phones around the world. Customers pay in cash at your store and the phone abroad gets topped up instantly. Store Owners Start Selling Start selling the top selling pinless international calling product, with over 3 million customer!